Of gnarly twine and knotted rope. Unseen valleys and hidden troughs. But the architect has gone. This science poem is inspired by recent research that has discovered how plant roots sense the availability of moisture in the soil and then adapt their shape to optimise their acquisition of water. Plants need roots in order to acquire both water and soluble nutrients from the soil, both of which are essential for plant growth. 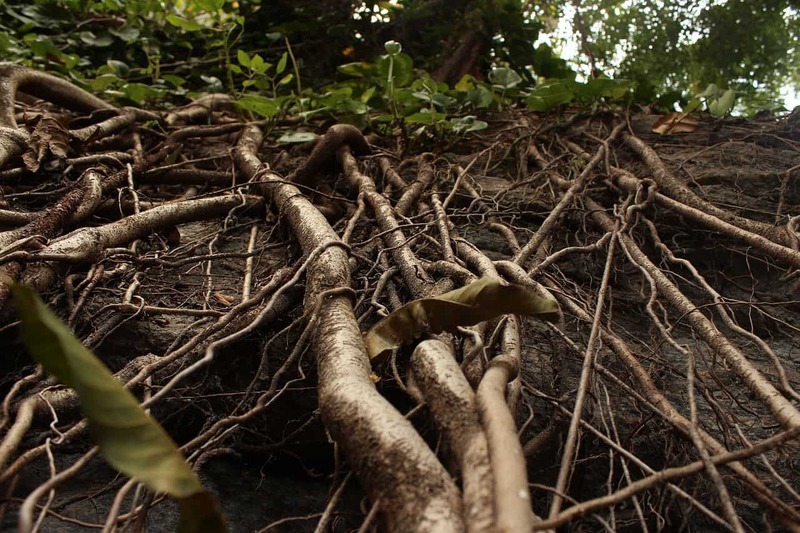 As the changing global climate makes acquiring moisture from the soil more difficult, plants are able to adapt to different soil moisture conditions by altering their root structure, but until now it was unsure how this was done. Root branches only form when in direct contact with soil moisture using an adaptive response termed ‘hydropatterning’. This new research has found that hydropatterning is controlled by a gene called ARF7; plant roots lacking ARF7 are no longer able to hydropattern. Furthermore, when plant roots are exposed to moisture ARF7 remains active and promotes root branching, but when the roots are exposed to air, ARF7 is modified and becomes inactive, blocking root branching in the process and thus making the future acquisition of water more difficult. This discovery could enable crops to be bred which are more adaptive to changes in climate conditions, such as water scarcity, thereby helping with future food security. Thank you John for these incredibly kind words – it means a lot coming from you. I have met Stephen a couple of times and am a big fan of his work, likewise of the SAW project which was a huge influence for me when we set up our SciArt unit at MMU.